One of my goals this year is to push myself outside my comfort zone more. That’s why, when I was invited to participate in the Crazy Ingredient Challenge, I cheerfully accepted. Every month the group votes on two random ingredients and we each have to come up with a recipe that uses both. This month’s ingredients are chickpeas and honey. 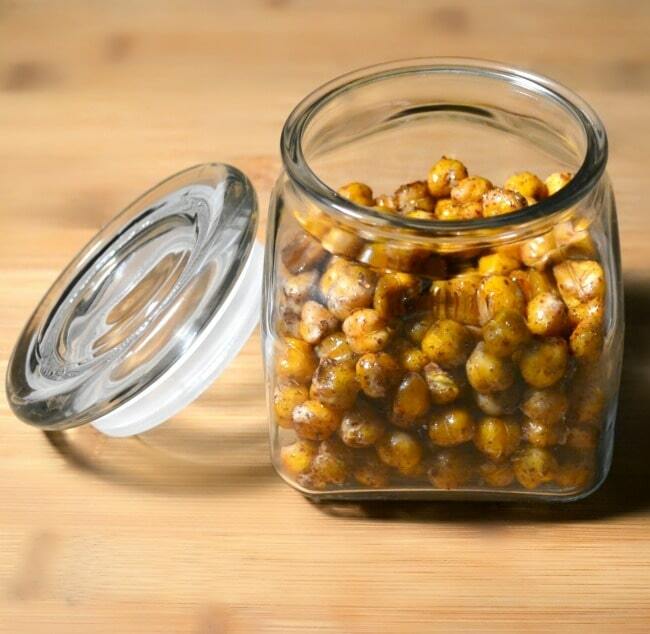 I’ve been seeing savory roasted chickpea recipes all over Pinterest and I love this snack idea! So, I decided to come up with a sweet version. 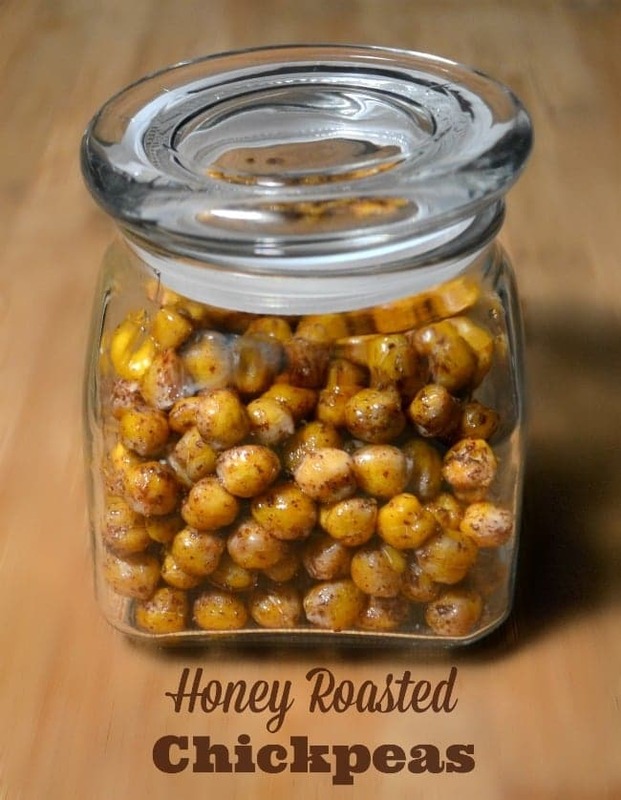 Today I’m sharing the honey roasted chickpea recipe I created. To be fair, I adapted my recipe from several others I found online. Turns out I wasn’t the first person to have this idea! I ended up changing quite a bit from the recipes I found online because I wanted both sweet AND salty. Plus, I wanted to leverage the health benefits of swapping chickpeas for nuts (less fat and fewer calories) so I omitted the oil found in most other recipes and used Splenda in lieu of sugar. The end result was a crunchy, delectable snack that satisfies any craving with a lot less guilt than I have when I eat several handfuls of honey roasted peanuts or an entire bag of kettle corn. 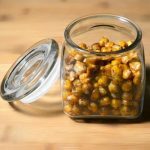 Not only are these honey roasted chickpeas a delicious, low-fat, low-calorie alternative to honey roasted nuts, they’re way cheaper too! The chickpeas are less than $1/can and you use only small amounts of the other ingredients (which you probably already keep on hand). This sounds really good! I’ve never thought about roasting chickpeas before. I will have to add this to my healthy snack recipes I want to try. I pinned it for you and will be sharing on my FB page sometime soon. These are great! I’ll be giving this a try. Welcome to the group! And nice recipe – looks familiar. 😉 I didn’t put salt on mine though, good call! Gotta love a low fat high protein snack. And I am partial to the sweet and salty combo. I love tossing chickpeas with some olive oil and spices before roasting, but I have never thought to do something sweet like this! I must give it a try!! I admit I never would have thought of combining these 2 ingredients, but you’ve convinced me to give your recipe a try. I’ve been looking for healthier snack options. LOL. Me neither. I was amazed at how creative some of the recipes were! Slightly terrified at what mystery ingredients will pop up next month and how I’ll manage to pair them. I love roasted chick peas, sweet or savory/salty. I agree! They make a wonderful snack.